The driving force behind establishing the Pinacoteca Ambrosiana was Federico Borromeo, archbishop of Milan from 1595 until his death in 1631. Borromeo, cousin of Saint Carlo Borromeo, was an important figure in the counter-Reformation movement. 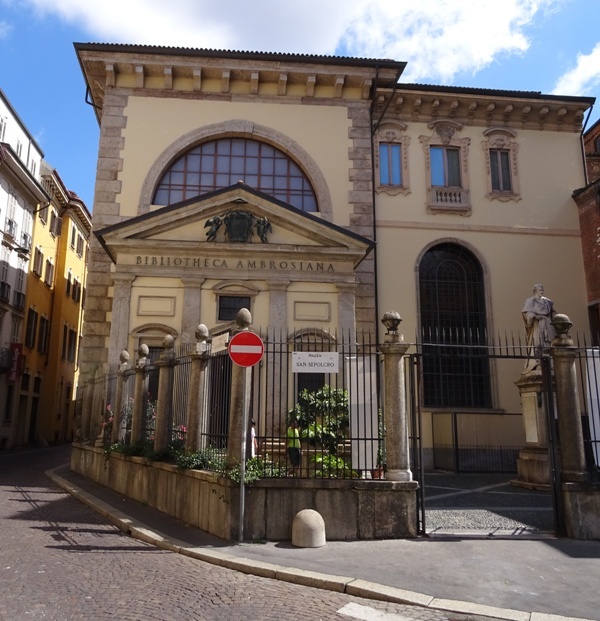 In 1609 he founded the Bibliotheca Ambrosiana, one of the first public libraries in Europe. It was intended for Catholic scholars who could come here to gather knowledge to stem the tide of Protestantism, which was sweeping across Europe. In 1618, an art gallery was added to the library. Borromeo donated his personal collection of paintings and drawings to the museum, and later more works were acquired by or gifted to the museum and put on display. Finally, in 1620, the Accademia del Disegno was founded, aimed at training young artists in the artistic traditions of the counter-Reformation. 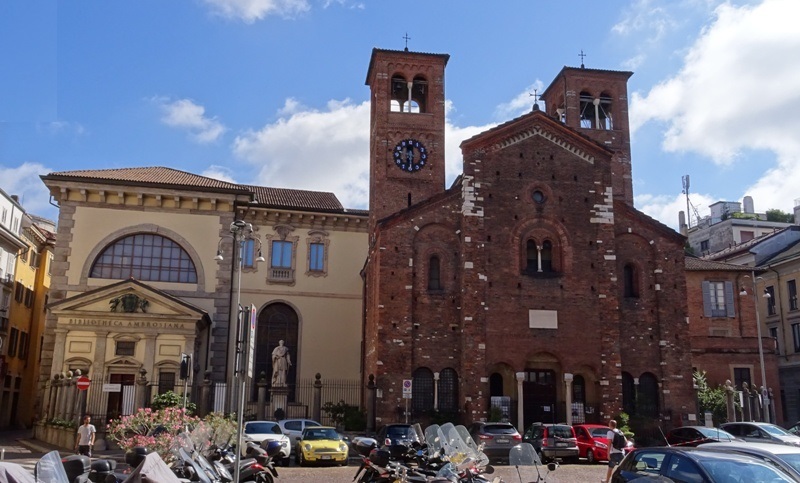 The Ambrosiana – as I will call it from now on – was expanded in the nineteenth century and again in 1932, when the former church of San Sepolcro was incorporated into the library and museum. The building suffered damage during World War II and had to be restored. The doors were closed in 1990 for extensive renovations and the Ambrosiana did not reopen until 1997. Among its top pieces is the Codex Atlanticus, a collection of drawings and writings by Leonardo da Vinci comprising more than 1.100 pages. It also houses some strange items, such as a lock of Lucrezia Borgia’s hair and the gloves worn by Napoleon during the Battle of Waterloo. 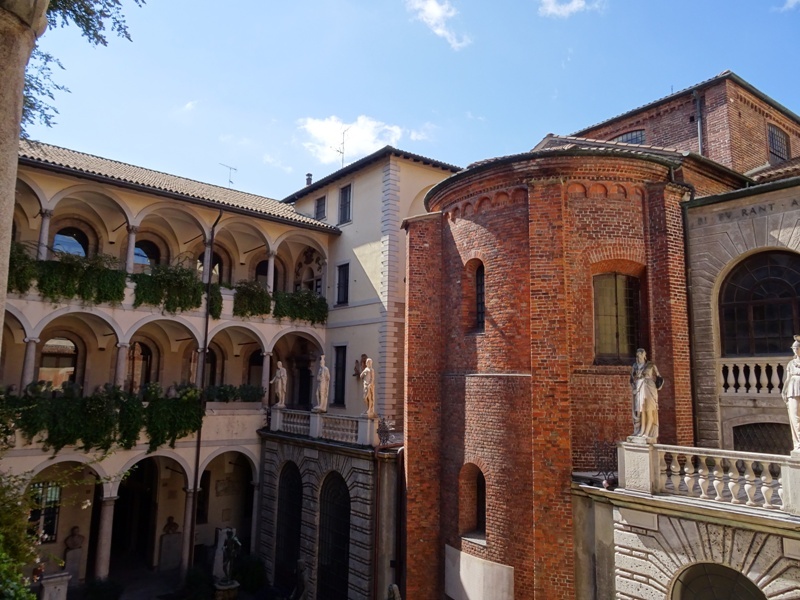 The Pinacoteca consists of some 24 rooms and my travel guide calls it “one of the most beautiful museums of Milan”. The Biblioteca and the former San Sepolcro. The art collection of the Ambrosiana is certainly impressive. However, there is one thing about the museum that bothers me: it appears that the Ambrosiana still has a strict “no photo” policy in the galleries (photos outside are fine). Taking pictures – without flash of course – does not seem to be a problem in Italian museums anymore. 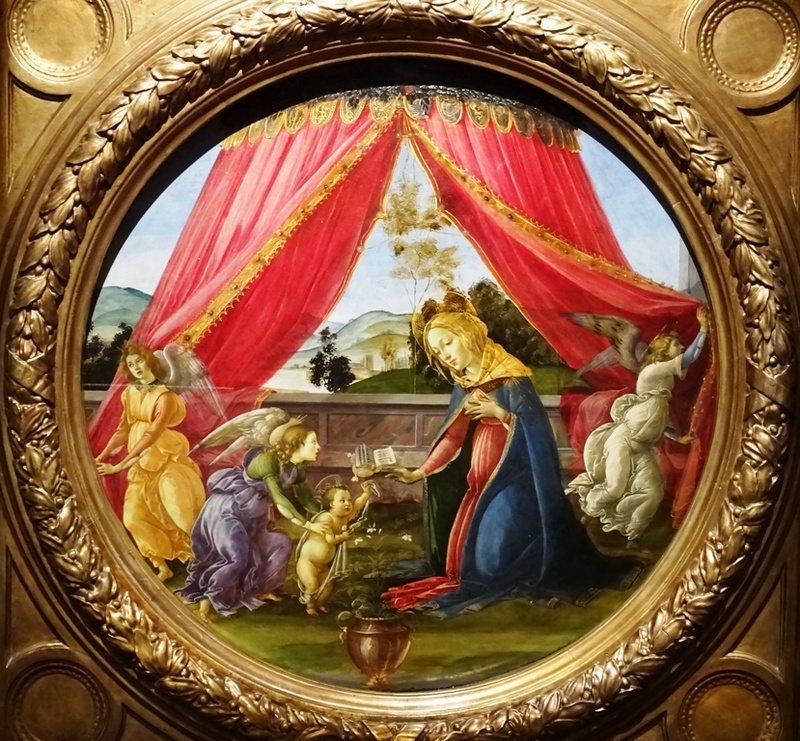 I could even take pictures at the Uffizi in Florence and it was allowed in other Milanese museums as well (the Brera for instance, and the Museo Poldi Pezzoli). But when I had taken a few photos in the Ambrosiana, I was kindly asked not to do that anymore. Other visitors were admonished too. Unfortunately this means that I did not get a chance to photograph some of the Ambrosiana’s top pieces, for instance Caravaggio’s Basket of Fruit, Leonardo da Vinci’s Portrait of a Musician, an Adoration of the Magi by Titian or Raphael’s sketch for the School of Athens, which he later painted in the Vatican. My website is all about the history that I can actually show to my readers. Without photos, this is rather difficult. I will therefore discuss just three paintings that I consider the highlights of the museum and give links to websites where images of the paintings can be found. The Ambrosiana has an Adoration of the Child by the workshop of the prolific Florentine painter Domenico Ghirlandaio (1449-1494). My travel guide calls this work an “absolute masterpiece”. I do not agree. While the painting is certainly interesting and the colours are pretty, I much prefer Ghirlandaio’s frescoes in the Sassetti Chapel in Florence. The Adoration of the Child may have been inspired by the altarpiece of that chapel, an Adoration of the Shepherds. Both the ox and the donkey look quite similar, as does the manger with the garland. The composition of the work is much simpler though, and much less detailed. An interesting detail is a praying man in the background on the right. On the left, we can see horsemen approaching, presumably the Magi. The pink spot in the sky is the angel of the Annunciation. A picture of the painting can be found here, but note that it is flipped (left is right and right is left). We move on to a Madonna and Child by Pinturicchio (ca. 1452-1513). “Pinturicchio” – which means “little painter” – was of course not his real name: he was born in Perugia as Bernardino di Betto. I could not find much information about the painting, but it has a few interesting details. The man in the foreground with the red cap in his hand is presumably the man who commissioned the painting. Above the Virgin, we see clouds with the faces and wings of angels. On the left, Pinturicchio painted a city in the background with a road leading to it. On the road, a man on horseback seems to be fighting two men on foot. The painting may have been commissioned for private devotion. It can be viewed here. Madonna del Padiglione – Botticelli. The paintings discussed so far are all quite good, but my personal favourite is a Madonna and Child by the Florentine painter Sandro Botticelli (ca. 1445-1510). It is known as the Madonna del Padiglione, the Madonna of the Pavilion. The painting has its own page on Wikipedia, and since plenty of pictures of the work seem to circulate on the Internet, I will post the photo here that I took before being told not to take pictures by a custodian. I strongly feel that constitutes fair use. I am not making any money by publishing it, it is a fairly lo-res picture and I am more or less advertising for the Ambrosiana. I furthermore encourage anyone to go and see the real painting over there. The painting is truly magnificent. We see one angel supporting the Child, while the Virgin is baring one of her breasts to feed it. The two other angels in the scene seem to be opening the tent flaps so that the viewer can see what is going on inside the pavilion. The painting can be dated to about 1493 and was executed when Botticelli had already come under the influence of the firebrand preacher Girolamo Savonarola from Ferrara. In this late period in his work, Botticelli almost exclusively painted religious scenes and did not pay much attention to correct perspective anymore. The angels, for instance, are much smaller than the Virgin, whose head looks a bit oversized. Botticelli returned to the earlier Gothic style here, where size was an indication of importance.